While doing some background research on the evolution of South Korea's nationwide LTE networks, I ran across a very informative graphic, compiled using data gathered from users of the BenchBee Speed Test for Android. (click on the graphic to see a full size version) Although text on the graphic is in Korean, it is easily interpretable. 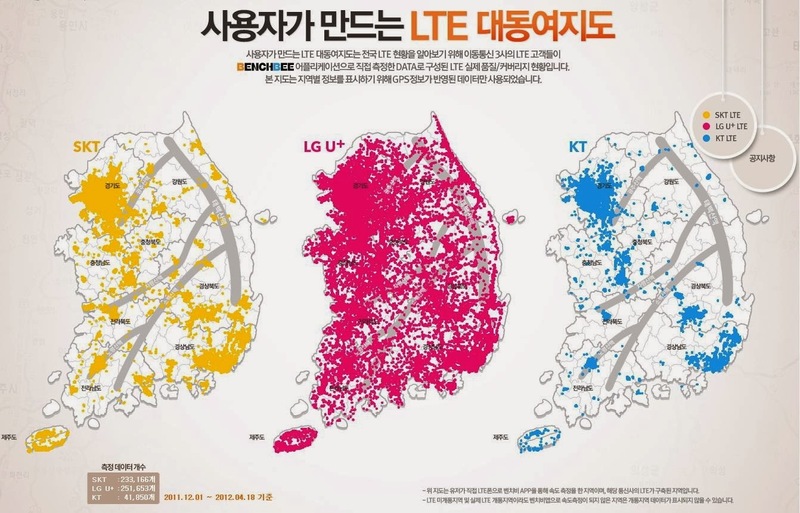 As indicated in the headline and three lines of text following, the three maps provide a representation of LTE coverage by the three major mobile service providers, SKT, LG U+ and KT based on BenchBee user data gathered between December 1, 2011 and April 18, 2012. Only GPS data were used to generate the maps, which give an accurate representation of service/coverage at that time. LG U+, which started building its LTE network before the other two providers, clearly had more extensive coverage at that time. Great visualization! It also appears to be based on solid data, since the BenchBee App, currently available only in Korea, is quite popular with users.